Events listed here are for the FableVision family, including events for founder Peter H Reynolds, FableVision Learning, FableVision Studios and the Reynolds Center for Teaching Learning and Creativity that are of interest to educators. Now/Next in Learning Conference celebrates how far learning has come and explore where it’s headed next. Expect to be inspired through compelling stories and examples of collaboration in education that have driven progress in learning to new heights. FableVision Learning will be leading the discussion on Why Engage Students in Career Programs in Middle School? They will share their animation career journey and the results that it is already showing. The Libraries, Games, and Play conference will bring together leaders and innovators who have created engaging games-based programs in libraries. The American University Game Lab and FableVision Studios will be hosting the conference. The forum will bring together diverse stakeholders including leadership in school, public, and university libraries to provide best practices and future trends for games and game-based activities. FableVision Learning is a proud sponsor of the 2019 Teachers of Promise Institute, created to identify and recognize the best prospective teachers from college and university schools of education across Virginia. We will introduce the new teachers to the Creative Classroom. The School of Education and the Jo-Linda and Dennis Keith Distinguished Speaker Series 2019 speaker is FableVision Founder and acclaimed author and illustrator Peter H. Reynolds. He will visit Syracuse for a two-day residency on Tuesday, March 19 and Wednesday, March 20. There will be two events that are free and open to the public in addition to the time with Syracuse students. FableVision Learning founder Peter H Reynolds is speaking to art educators at the National Art Education Association annual conference. Discover how art can empower educators and students alike in the classroom. Explore FableVision Learning’s Fab@School Maker Studio, the design and fabrication program accessible and affordable to all schools and libraries in a hands on workshop. Create your own design to take away. Meet Peter H Reynolds at the BETT show in London! Meet FableVision Learning’s founder and creativity champion Peter H Reynolds in London. Peter will be at BETT speaking on creativity and the power of the individual teacher on Friday the 25th of January 2019 in the BETT Arena! With the backdrop of declining creativity, Peter H Reynolds will inspire teachers to pick up the gauntlet and respond to the challenge. Teachers CAN make a difference in their classrooms while leaders debate. Peter will challenge each person to CREATE BRAVELY. FableVision Learning CEO Paul Reynolds will keynote the conference. There will also be a break out session to explore FableVision Learning’s Fab@School Maker Studio, the design and fabrication program accessible and affordable to all schools and libraries. EdGames showcases successful ed tech products given a kick start with government small business grants through the ED/IES Small Business Innovation Research program. Learn about the innovative technology and unique features of Fab@School Maker Studio in making design and fabrication accessible and affordable to all schools and libraries. Join Paul and Peter H. Reynolds at the NCTE Annual Convention on Sunday, Nov. 18, for the closing keynote, at Noon. At NCTE come celebrate students’ voices and the impact they make in the world. Also meet the FableVision Learning team and see the literacy tools and programs for your classroom. Join us for a hands-on session at Building Learning Communities Educational Conference on Wednesday, July 25 at 10:20 a.m.
From kindergarten to high school, discover how schools, libraries, and programs around the country have used Fab@School Maker Studio to create practical, affordable 2D and 3D designs using paper, card stock, and inexpensive digital fabricators. This session provides hands-on opportunities for getting comfortable with easy, paper-based digital design and fabrication software tools. Participants experience the benefits of rapid paper prototyping, which allows for quick cycles of testing and iterative design enhancements - especially helpful within limited class periods. Explore research-based best practices, appropriate to get all students (PreK-12) designing and creating. We encourage participants to bring their devices. Join FableVision Learning's Jane Reynolds and Dr. Denine Jimmerson at the Florida Association for Career and Technical Education on July 16-18, 2018, at the Champions Gate Resort. On Tuesday, July 17, they will hold a session titled: Creativity to Careers: Middle School Animation CTE as a Model. The session will introduce school districts to our new model to which creates a continuum from middle school to high school and beyond, progressing from Animation-ish to Toon Boom software and gaining experience and certification on the journey. While some schools are using animation in middle school for content and creativity, middle school teachers can be outside of their comfort zone in approaching CTE. We can provide unique scaffolding for both teachers and students with our Creativity to Careers program. We have developed the fundamental elements to expand the uptake of animation as a bona fide CTE program in middle school. While teachers can continue to use our animation software as they do now, we will add the curriculum, training and professional development to link the program to a career path. Our own FableVision professional animation studio in Boston MA is our model for students, and they can have virtual access to the studio for tours and mentoring. We have linked with Summit Global to provide the middle school certification. We have applied for listing as on Florida Digital Tools. The goal of our Creativity to Careers program is to ensure a good take up of animation CTE in high school by starting in middle school, giving students the opportunity to test out careers before committing to a 2 year program. While learning animation, students will also be developing core work skills in communication and collaboration, as well as a host of inherent skills within an animation studio. Peter H Reynolds will be attending West Hyannis Elementary School as part of the Cape Cod's YMCA Teen Achievers Program which mentors high school students who are “at risk” and the first generation in their families to consider college in their future. Part of the program involves a community service to promote literacy which they do with the West Hyannis Elementary School. Each year the high school students go to Hyannis West to read with the younger children, to celebrate literacy and to promote summer reading at home. The local Rotary Club also is part of this partnership and purchase of a book for each classroom that is chosen by it’s focus on reading. This year, it is the wonderful “Word Collector” and Peter H Reynolds will be on hand to read the book to the students! Join Dr. Denine Jimmerson, Executive Director of Curriculum & Design, FableVision Learning, on Thursday, May 24, at 3:30 p.m. (CDT) for a free webinar through Closing the Gap. During this session, titled " Permission to be Brave: Promoting Creativity for Learners with Special Needs," we will share how districts across the country use the 4Cs with special needs learners. We will showcase examples of collaborative STEAM-projects, digital storytelling, creative career pathways, and assessment. Walk away with ideas and strategies for empowering EVERY student across all grades. FableVision Studios and Big Picture Learning cordially invite you to celebrate the launch of our first animated film collaboration, Navigating Our Way! The Navigating Our Way film kicks off a new leading national initiative - of the same name—committed to shifting how society values career and technical education (CTE) and the skilled trades. The time is NOW to help all students follow their interest and pursue their passions. We are excited to share and connect with others who want to change the narrative—including educational leaders, policymakers, researchers, and industry stakeholders. The first film in the series, Navigating Our Way is narrated by award-winning film and television actor and New Orleanian Wendell Pierce. The story features two childhood friends’ very different learning journeys; Seymour leaving for college, and Sylvie staying home in New Orleans where her passions lie—in the shipyards and with the trades. They're ultimately reunited to find that their individual successes lead to a beautiful partnership. Navigating Our Way was written by Elliot Washor (Big Picture Learning) and Paul Reynolds (FableVision)—with character design by New York Times best-selling picture book author Peter H. Reynolds. The film’s original music score was composed by New Orleans native Brian Richburg, Jr. in collaboration with composer Tony Lechner. Save the date and come celebrate with us! Can't make it to the event? Join us on Facebook for a live stream! Free and open to the public. RSVP required. Light bites and drinks provided. Each year at the Annual Conference of the Massachusetts Reading Association (MRA), an award is presented to an author or illustrator who has made a significant contribution to children’s literature. 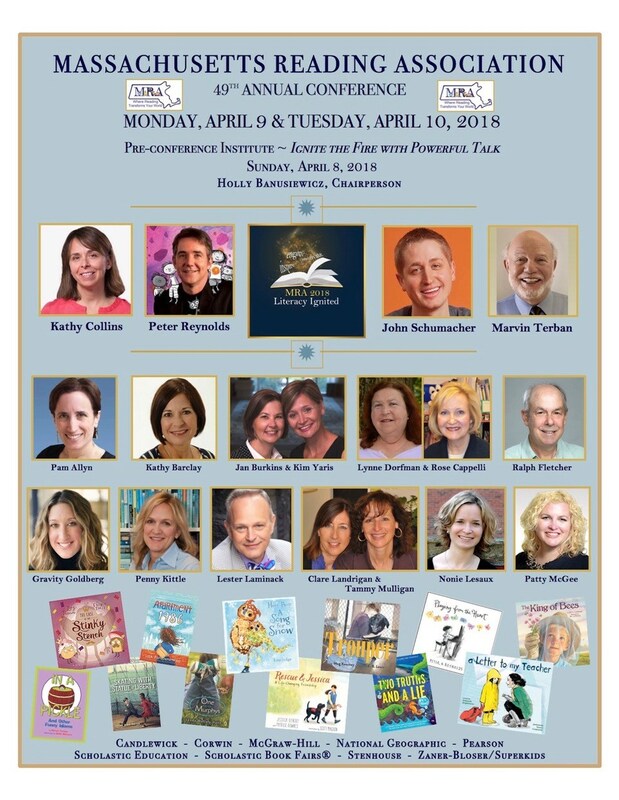 This year, Peter H. Reynolds will be accepting MRA Children’s Literature Award at the 46th Annual Conference on Monday, April 9, 2018 in Quincy, MA. The recipient must have won at least one major award. His/her books are exceptionally notable and leading examples of the genre to which they belong. The nominee’s books have been available to children for at least ten years. This award will be presented during the Monday afternoon closing session of the spring 2018 conference. Peter will deliver the keynote address prior to accepting the award. Previous recipients include: Marc Brown, Rosemary Wells, Patricia MacLachlan, Jane Yolen, Tomie DePaola, Laura Vaccaro Seeger, Lois Lowry, Katherine Paterson, and the Pinkney family. Massachusetts Reading Association will host an early Monday evening reception entitled “Authors and Appetizers.” This reception, held from 5 to 7 p.m., highlights the work of both the award recipient and rising local authors. Book sales and autographing take place as part of the reception, as well as throughout the conference. Paul Reynolds will be the featured speaker at Cause Camp on Tuesday, March 27. When: March, 27 at 9:15 a.m.
FableVision co-founders Peter and Paul Reynolds will be Friday's keynote at the CUE spring conference at the Palm Springs Convention Center. When: March 16 at 3:30 p.m.
Join the FableVision Learning at the spring 2018 CUE conference in Palm Springs, CA on Thursday, March 15 - Saturday, March 17, 2018. The team will host a concurrent sessions in room: Mesquite H. For more information please click, here. During this session we will share how districts across the country use the 4Cs with special needs learners. We will showcase examples of collaborative STEAM-projects, digital storytelling, creative career pathways, and assessment. Walk away with ideas and strategies for empowering EVERY student across all grades. When: Thursday, March 15 at 10:30 a.m. -11:30 a.m. and Friday, March 16 at 12:30 p.m. - 1:30 p.m.
From kindergarten to high school, discover how schools, libraries, and programs around the country have used Fab@School Maker Studio to create practical, affordable makerspaces using paper, cardstock, and inexpensive digital fabricators. This session provides hands-on opportunities for getting comfortable with easy, paper-based digital design and fabrication software tools. Participants experience the benefits of rapid paper prototyping, which allows for quick cycles of testing and iterative design enhancements - especially helpful within limited class periods. Explore research-based best practices, appropriate to get all students (PreK-12) designing and creating. When: Thursday, March 15 at 12:30 p.m.-1:30 p.m.; Friday, March 16 at 10:30 a.m.-11:30 a.m. and 2 p.m. - 3 p.m.; and Saturday, March 17 at 10:30 a.m.- 11:30 a.m. This session will show powerful examples of how schools across the globe have implemented digital storytelling strategies using animation and publishing programs to engage students in deeper exploration of content. The programs highlighted will be easy to use and based upon award-winning Author/Illustrator Peter H Reynolds' inspiration for both students and teachers alike in the power to tell a story. Get-hands on with Animation-ish and watch your stories come alive. When: Thursday, March 15 at 2 p.m.- 3 p.m.; Friday, March 16 at 9 a.m. - 10 a.m. .; and Saturday, March 17 at 9 a.m. - 10 a.m.
Join FableVision’s CEO and co-founder and author Paul A. Reynolds and his identical twin brother, Peter H. Reynolds a New York Times Best-Selling Author and Illustrator, in an informal session, something we like to call the Fireside Chat. This is a unique opportunity to sit down with Peter and Paul and personally connect with them. Go behind the scenes of what it is like to manage an impact company like FableVision and a he Reynolds Center for Teaching, Learning, and Creativity. Learn how the brothers collaborate in creating stories, books, and animations. Their latest collaborations include “Going Places” and “Sydney and Simon” a STEM chapter book series that gets high marks from its readers and the publishing industry. This is a great time to ask questions about your own stories and illustrations and perhaps share one your creations. Bring a cup of tea, sit back, and get ready for an inspiring hour. When: Thursday, March 15 at 3:30 p.m.- 4:30 p.m.
Three award-winning author/illustrators share their process of creating picture-books that inspire and encourage imagination and hope for readers, both young and old. Be inspired by Peter Reynold's "The Dot and Ish" and his recent books on dreaming and word collecting, Bob Staake's "Bluebird and The Book of Gold" and Lita Judge's "Flight School" and "Hoot and Peep." When: Sat, Mar 10, 1:00 p.m. - 2:00 p.m. Learn to draw with award-winning author and illustrator Peter Reynolds! Inspired by his latest work, "The Word Collector," audience members will learn how to express their favorite words in colorful art forms. When: Sun, Mar 11, 2:30 p.m. - 3:30 p.m.
Color connects children to beauty, emotion and creativity and transforms their perspectives on the world. Three authors, whom are also illustrators, explore the power of color in their picture-books. Maya Christina Gonzalez celebrates the colors of the desert in "My Colors, My World," while Peter Reynolds examines the many colors of the sky in "Sky Color" and Jillian Tamaki plays with the colors in a young child's life in "They Say Blue." When: Sun, Mar 11, 11:30 a.m. - 12:30 p.m.
FableVision founder and New York Times best-selling author/illustrator Peter H. Reynolds will be a featured Keynote at the Anderson’s 16th Annual Children’s Literature Breakfast. The breakfast will be held Saturday, Feb. 24 at 8 a.m. - noon. at 6440 Double Eagle Drive, Woodridge, IL. Peter joins other featured Keynote Speakers: Brian Selznick, Charlotte Jones Voiklis & Lena Roy, Linda Ragsdale, and Leslie Connor. Attendees will enjoy a full breakfast while an author or illustrator joins you for table discussions between the keynote speakers. There will also be raffles, goody bags, book talks on the newest in Children's Literature, an on-site bookstore and continuing education hours. For more information and to purchase tickets please click, here.